Product prices and availability are accurate as of 2019-03-16 07:28:59 EDT and are subject to change. Any price and availability information displayed on http://www.amazon.com/ at the time of purchase will apply to the purchase of this product. 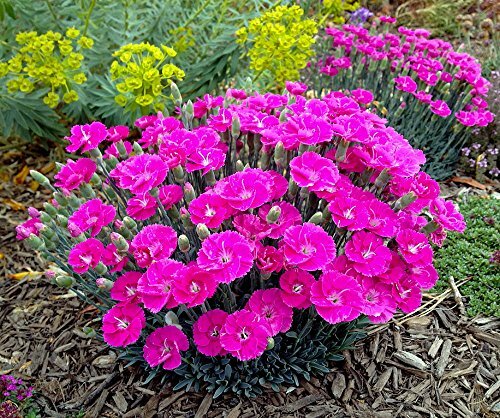 (Pinks) Dianthus 'Shooting Star' PP16,431 is another wonderful addition to the "Star" series of Dianthus! Could this be the best one yet? We think so! 'Shooting Star' PP16,431 forms neat and compact evergreen mounds that remain attractive all season long. The glaucous blue-green foliage is covered with hundreds of magenta purple flowers in early spring and again in early fall after dead-heading. The delightful spicy clove fragrance is an added bonus!